On June 29, 2018, Portland State University (PSU) police officers Shawn McKenzie and James Dewey shot and killed Jason Washington, a 45-year-old black man, U.S. Postal Service worker, and U.S. Navy Veteran, who tried to peacefully break up a fight outside the Cheerful Tortoise bar near PSU just before closing time. This killing inspired a resurgence of the #DisarmPSU movement, which staged a 24/7 occupation of the Campus Public Safety Office calling for the firings of both officers involved and the disarming of campus police. Socialist Alternative member BRANDON MADSEN spoke to OLIVIA PACE, a key student leader in the #DisarmPSU struggle and also a Socialist Alternative member in Portland, about the origins of the struggle, the prospects for victory, and the lessons for the broader Black Lives Matter movement against racist police violence. Brandon Madsen: Could you tell us a bit about what’s going on in this occupation? How did this all start? Olivia Pace: On June 29 of this year, Jason Washington was killed on campus. He was a black man who was de-escalating a bar fight (without using the completely legal firearm that he had holstered on his hip). When police arrived on the scene, they shot at him 17 times, hitting him 9 times, and killing him almost immediately. We’ve done a series of escalating actions following Jason’s death. We worked with the family to coordinate a rally and a march for the first day of school. Then, after two months of planning, we began our occupation of the campus public safety office. We don’t want people to be able to come into this space without being reminded of what happened to Jason Washington; without learning about our campaign; without learning that there’s an alternative to the way that the campus is being policed right now; without learning that we didn’t have armed officers three years ago, and that armament was a choice that was made fundamentally for the financial benefit of the board members. 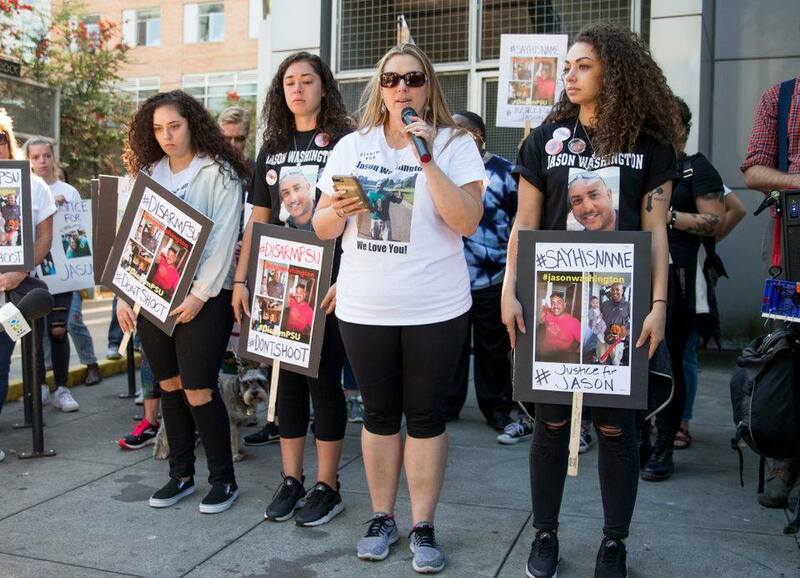 Jason’s murder came on the heels of a five-year struggle during which PSU students, staff, and faculty continually urged the university not to arm campus security officers. The university refused to listen, arming the officers in 2015. This unilateral decision by our Board of Trustees, an unelected group of mostly corporate executives and lobbyists, led to outrage on campus, and to students launching Disarm PSU. Jason’s murder has since exposed the Board’s decision as stemming from a callous disregard for our lives and proves that we were right to fight against arming campus security. We intend to be here until we see a serious intention to reverse that policy by the administration and by the board members. BM: What does victory look like? What are the demands of this campaign? OP: Our three current demands are: Completely disarm campus police officers; fire officers McKenzie and Dewey; and erect a memorial to Jason Washington and have that process be led by the family – not just because that would be right, but because the family has tried to maintain a memorial at the site where Jason was killed. The school has continually violated that memorial and forced them to take it down, so we would like them to be forced to permanently memorialize Jason Washington. BM: Do you see this as connecting up with the broader Black Lives Matter movement? OP: Disarm PSU is, to me, definitely an iteration of Black Lives Matter in this city. We call for police officers not to have the capacity to murder people, especially because we know that it disproportionately affects black and brown people. Plus, the situation with Jason Washington is really similar to situations that we’ve seen since the Black Lives Matter movement started, especially the story of Philando Castile. BM: What strategy are you and the other activists using to try to win this? What is it going to take to win, in your opinion? OP: It’s going to take an exorbitant amount of pressure, and it’s going to take a serious fight. Pressure in terms of causing harm to the school’s reputation – which is very dear to them – and financial pressure. We have always known that it’s going to take that; we just needed the numbers. The only way they’re only going to reverse this policy is on the basis of preserving their own financial and political interests. If students, staff, and faculty can back them into a corner, saying in unison “we are ready to shut down business as usual at this school, regardless of whether that means ruining the school’s reputation, or causing the school to lose donations and prestige – we are going to force you into a position where you have to disarm campus police.” It’s not enough to convince them that it’s right, because they were never concerned about our safety to begin with. BM: What are the lessons to be drawn for other student activists who want to stop militarization of their campuses? What advice do you have for them? OP: Know your enemy, and your potential allies. It took us years to build the base of knowledge about who exercises power over our university and how. If the core organizers here didn’t know the inner workings of this institution; if we didn’t know that 68% of the faculty had voted to oppose armament in 2015; if we didn’t know that the School of Social Work protested the policy in 2015; we would lose a serious advantage. This way, we understand the massive base of support for disarmament. The key is turning that huge passive support into active participation, which requires patience, and a keen sense of timing. It has taken us five years to get here. We went from being a small group of about seven people who would put tape over our mouths in board meetings in 2015 to having rallies of 100 people in the park blocks, to going to the president’s office and putting statements and videos out on Facebook shaming him, to having a 500-person walk-out, to planning a hundreds-strong rally within two days after Jason’s murder, to getting finally now getting national coverage on the first day of school, taking over the Campus Safety office, and being confident that we can hold it. Also, just systematically reaching out to people who are going to be on your side and the forces that will legitimize and popularize your struggle. We need the faculty on our side. We need to get the media on our side, and they slowly have come more to our side. We need the family on our side, we need student government on our side, those legitimizing forces. If you can figure out where that common ground is, and leave your opponents at the top isolated, that is critical to having a chance at winning. BM: How were you able to unite all these forces together without watering down your demands and methods of struggle? OP: Lots of people agree with the demand to disarm Portland State University’s campus police. People can see that what’s happening is wrong, that something needs to be done, and that there are institutional forces blocking all these potential solutions to the problem of racist policing and racist police violence. We don’t push people away who have a different idea of why we should do that than we do. We can of course have friendly discussions and debates within the movement, but we never lose sight of the common goal we’re all fighting for right now. But we don’t hide our ideas. We don’t think the police should have a capacity to kill anybody and get away with it. We think that any mechanism to keep the community safe, including policing, should be run by that community. These are things we’ve always been open about. What’s key is being patient and open when we hear people. People all have their own rationale, their own pathway to this struggle, even if it’s different from ours. And rather than pushing them away when we don’t fully agree right away, we take the time to understand where they are coming from and use that as a bridge to help bring them more fully on board. BM: How do you see the #DisarmPSU movement as fitting in with the broader struggle to transform society? OP: This movement did not occur in a vacuum. We are part of a tradition across generations and around the world, but also specifically at this school, of fighting to defend the rights and safety of black people, poor people, women, and LGBTQIA community members and for an end to racist policing. We see the university as an institution built into the fiber of the capitalist system. We don’t just see the changes we’re fighting for as small reforms in one isolated institution, but as a way of training ourselves and others how to fight and win on issues affecting workers and youth in wider society. We’re trying to set an example and show what is possible. Also, we identify how students and young people are exploited through the accruing of student debt, through how the horrible financial burden of going to university is put onto young people’s backs. There are people with major influence over the university – investors, developers, businesspeople – whose stake in this university is purely financial, and the decisions they make flow from that. These decisions help enable the horrific amount of economic exploitation that occurs in universities. So, to fight back against their control and their policies is to fight back against one of the major sites of economic exploitation in our country and in the world right now.